Delivery of the first Boeing 787 Dreamliner is a year away, but the 250-seater is still the most successful commercial jet in aviation history. Fifty clients expecting bigger windows, better air pressure and humidity and more legroom have ordered 710 planes, worth $120 billion. 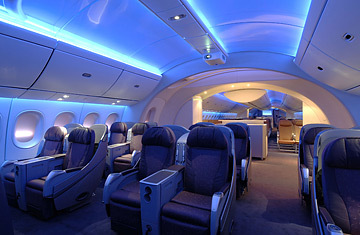 The 787's 50% composite structure makes it the greenest wide-body, using 20% less fuel than others its size.